— Credits between the episodes include two slogans used by the French situationists in 1960s. One of them is about the street performance, another is about the art which is everywhere. From the aesthetic and philosophical point of view (Aleksey – editor’s note) Mann, Semesyuk and K° were right. 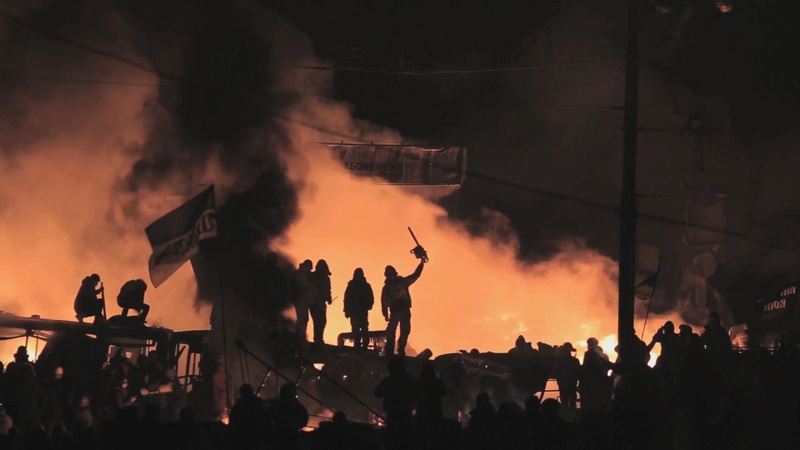 I saw the recordings of the Tahrir Square Revolution, films about other ‘color revolutions’, and such an aesthetisation of the space was never there. 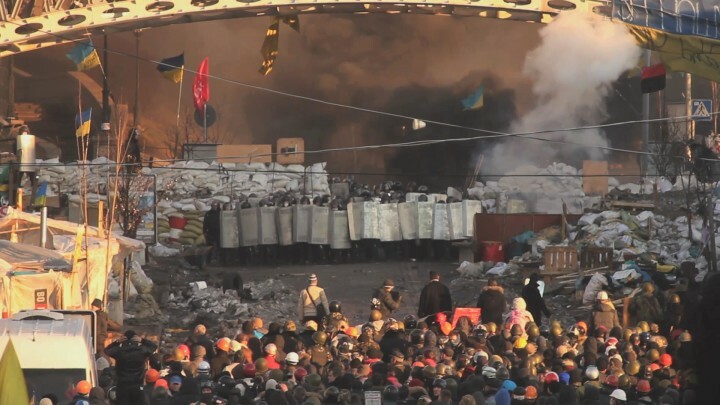 It is very interesting to state that it happened only at the Maidan in Kyiv. — Maidan was not even a myth. It was a living history that just acquired new heroes, unexpected visual clichés. But it seems to me that later this feeling disappeared. Perhaps that is why my film has such a conclusion (the film is concluded by the scenes of the war parade in May 2015 – editor’s note). Some people do not like my conclusion. 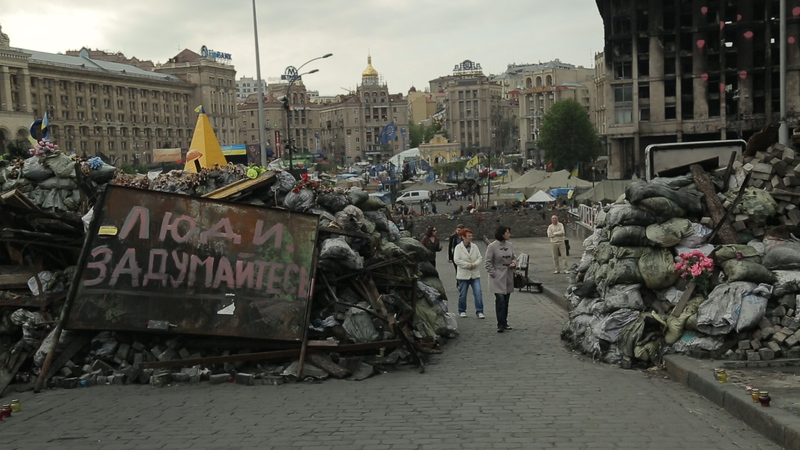 I felt I did not understand how they could treat the Maidan, a place of memory, in this way, I felt a kind of injustice. Yes, we needed to separate from the Maidan but, to my mind, it needed to be otherwise. This feeling of mine did not become a part of film but it contained an episode with all the heroes of the film discussing what should be done with this place later. And some really utopian ideas have been put forth. A revolution changes the social and political “landscapes” of a country, but first and foremost it changes the physical landscape. For centuries none of the city centers of the world capitals looked nothing like the Maidan in the last few months, which resembles a medieval town and a futuristic fantasy at the same time. A revolution changes the functions of things, moves them from their places, mixes up the concepts. 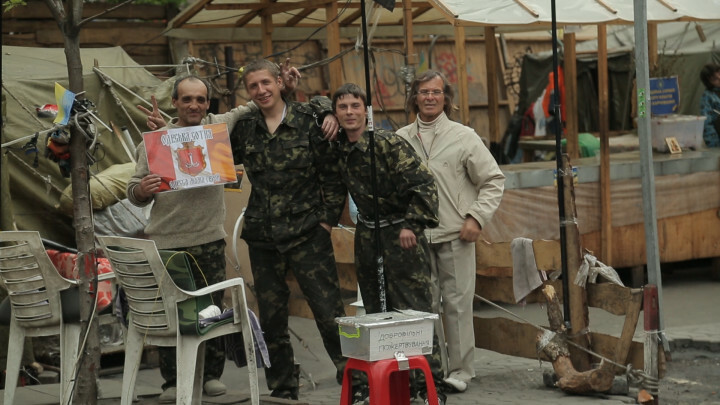 A light bulb becomes a vessel for a Molotov cocktail, car tires become building material for barricades, a shovel and a road sign become shields, and genres of contemporary art – installation, performance, happening – rule the Maidan. As a matter of fact, art remembers its primordial archetypical functions. A musician leads the battle, a designer draws billboards, a painter illuminates shields and helmets with ancient symbols of will and power, an architect designs a barbican (fortifications). Most of the artistic gestures shown in our film are elementary, utilitarian, naïve: we observe art that in many cases hasn’t yet divided itself from the crafts, as if aesthetics is born before our very eyes. 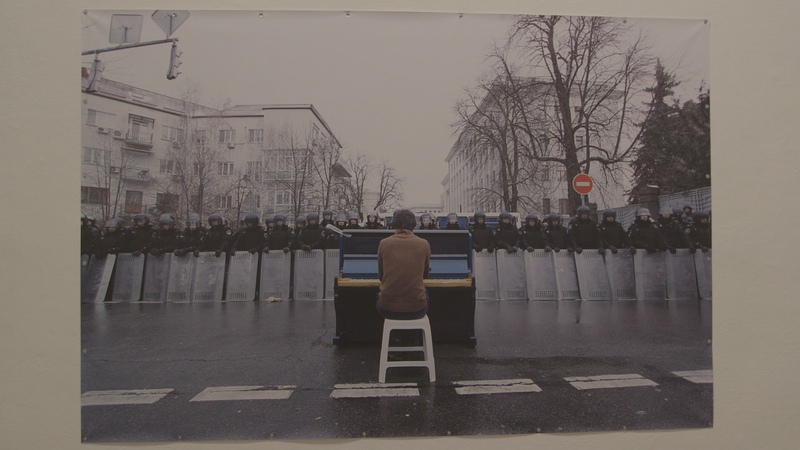 “The New Middle Ages” – that is what artists themselves call the art that originated on the Maidan. Catapults, shields and armor, painted batons – right after the revolution these simple items that were made by artists and members of Samooborona (Self-defence forces) migrated to art exhibits and museums. The blitz museefication of the revolution and the media images it was separated into is another theme of our film. The physical space of the Maidan itself – Kiev’s Independence square – during the months of the revolution turned into a total installation, a very complex and whimsically structured living organism. What is to be done with this place of memory? Should it be preserved, taken into pieces, turned into an open-air museum? What is to be done with one’s own memory, one’s unique and in many respects very traumatic experience? How can one overcome the emptiness that arose after such an emotional upheaval? 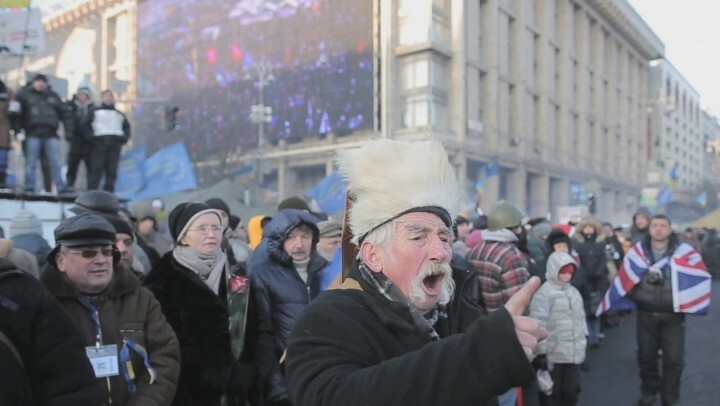 In our film artists, curators, museum workers, and Maidan activists speculate on what it feels like to live after the main event of your life is in the past, how to deal with trauma and preserve memories. The lively spontaneous art that emerged in the midst of the Maidan carnival in our film stands against the primitive aesthetics of the ruling elite. 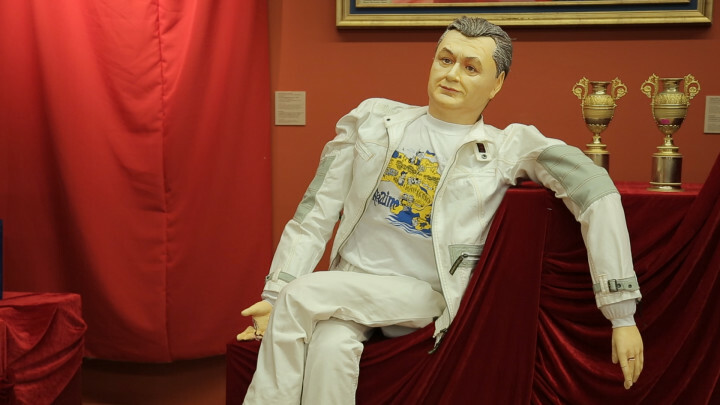 Modern art curators presented the cultural nullity of the “anti-Maidan” on an exhibition of objects from Mezhyhirya, the compound of former President Viktor F. Yanukovych, at the National Art Museum of Ukraine. 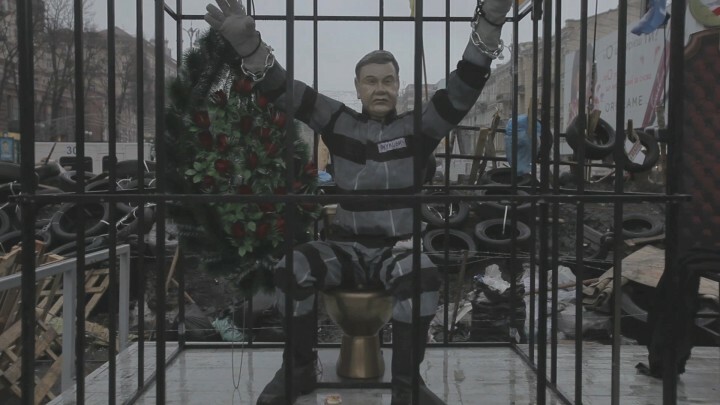 It is symbolic that the museum itself is located right next to the Maidan, on Hrushevskoho Street, where bloodily battles of protesters against Yanukovych’s special forces took place in the winter 2014. 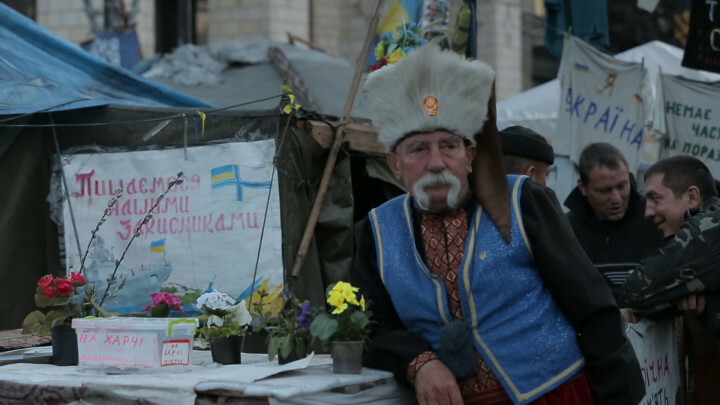 The president’s compound with its cult of ceremonial portraits and meaningless gorges of luxury is contrary to the simple, functional and energetic art that emerged on the Maidan. 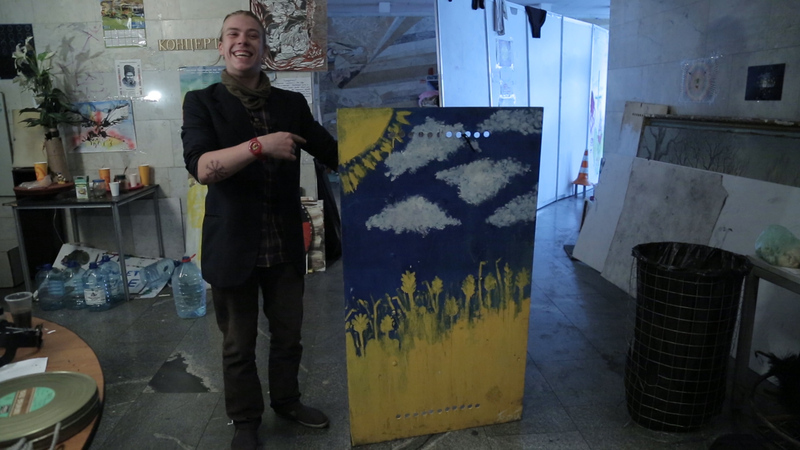 “This revolution became a cultural overturn,” says Olexa Mann from the Barbican art group. Artists, curators and museum workers became the main actors of the cultural revolution that is more important and momentous for the country then a shift of power. 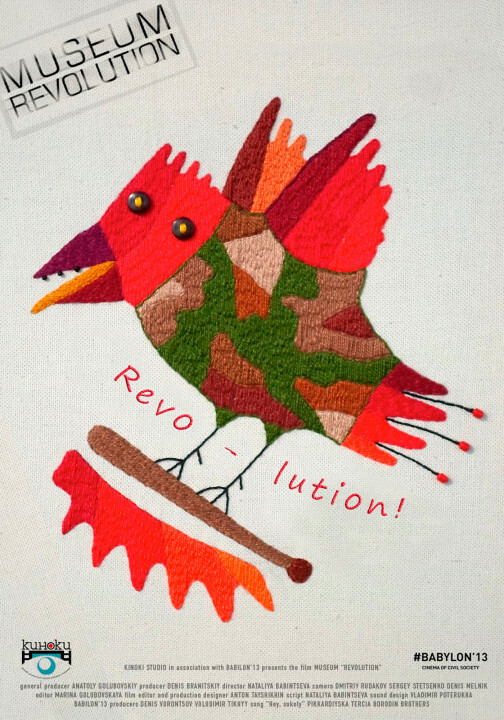 For us “Revolution” Museum is not a simple assembly of objects, items and works of art. It is a depository of emotions, frustrations, trauma, insight, personal histories, and phenomena of creativity in extreme circumstances. Anyone can enter and nourish on the energy that is concentrated here. It is an OPEN STORAGE– just like in a modern European museum. Museification by Babintseva is especially interesting because it shows the heterogeneity characteristic of the Maidan, bringing out clearly that any ‘evolutionary approach’ to the art is inadequate. Indeed, the range of world views operating in the same space, giving birth to naïve archaic protective amulets and to the conceptual imagery of a performance, making these two kinds of manifestations equally relevant and efficient – is an observation, which is unexpected and in the same time important from the culturologic point of view and therefore deserving close attention, – Ilya Bobylev, Iskusstvo kino. Burned stones and painted helmets: is it possible to museify the Maidan? Most films about revolution focus exclusively on documenting it. In such films there is no rethinking of the Kyiv events of the winter 2013-2014, there is no clear limit between the Good and the Evil. Indeed, now, a year and a half after the Euromaidan, it may be harder to see the difference between the positive and the negative sides of the revolution. One of the main ideas of the film is the confrontation between the precise popular art born at the Maidan and the bad taste of Mezhihirya. “This revolution was necessary from aesthetic point of view”, affirms one of the characters of the film, the curator of the exposition I Am a Drop in the Ocean that took place in Vienna, Konstantin Akinsha. And one of the slogans periodically appearing on the screen says: “Bad taste is socially dangerous”. All this needed a large social canvas, that would bring everything together in one picture and justify it. That is why the film addresses the Maidan as a kind of global artwork. This idea was in the air since the first weeks of the protest. …Faint notes of this grotesque appear in the film itself – in every scene with a reference to New Middle Ages. It is here that the idea comes to the mind: a question about the museification of the Maidan in the near future should probably be postponed. 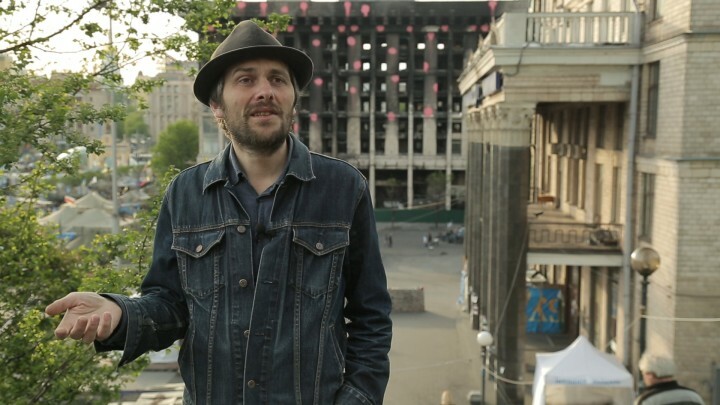 Ukrainian educational and artistic institutions do not yet manage to create a competent story that could include burned stones and rags from the Maidan. Babintseva zeigt den Maidan, wie er während der Revolte von unzähligen Menschen in Beschlag genommen wurde und dabei von Künstlern sozusagen in eine einzige, riesige Kunstinstallation verwandelt wurde und wie die Demonstranten mittels Kunstinstallationen Kritik am System übten. Schilder und Helme werden kunstvoll bemalt, Plakate mit dem verfremdeten Konterfei Janukowiytschs zieren die Wände, Musiker spielen auf den Straßen zusammen mit Demonstranten, die der Sicherheitspolizei – im wahrsten Sinne des Wortes – den Spiegel vorhalten und diese mit ihrer Position im Staatsgefüge konfrontieren und auffordern, eben diese zu hinterfragen.